The campaigners at Frankfurt Airport have won a night flight ban after the German courts today ruled in their favour. Flights will be banned from 11pm until 5am. It is thought the ruling could have implications for night flights at other European airports. Both Charles de Gaulle and Schiphol airports, where flights operate through the night, have been watching the ruling closely. 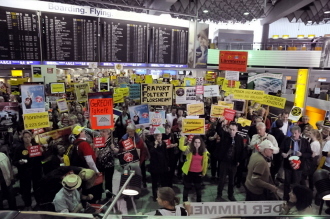 The night ban at Frankfurt is only one of the demands of the German protesters, thousands of whom occupy the airport terminal every Monday night (pictured above, courtesy Lärmfurt). They are objecting about the impact of the 4th runway which was opened in October. The night flight ban will apply to all the airport’s runways.